Apprien at the Quo Vadis 2019 Berlin indie advisory group ! The Team Apprien represented by Mr. Arto Käyhkö will be at the Quo Vadis 2019 Gaming Conference in Berlin participating the indie advisory group. Thanks to the invitation to Booster Space Berlin and Games:net Berlin-Brandenburg. “It is always interesting to meet and talk with the dynamic indie developers and hear whats cooking and coming up from their creative pots and pans next. I feel that the energy and commitment from the indie studios is inspiration for us all”, says Mr. Käyhkö, partner and Vice President of Apprien ltd. 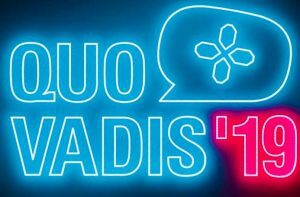 QUO VADIS is the core B2B event during two days of Games Week Berlin. In 2019, it will be a new and holistic experience: central, convenient and perfectly integrated into this one week full of gaming events connecting business, technology and culture. The reason for that: with the new host Booster Space, the organizers of gamesweekberlin themselves are responsible the QUO VADIS for the first time. It consists of keynotes, talks, roundtables and workshops focusing on individually tailored tracks for business developers, game developers, community developers and other industries interested in digital games. Berlin is one of Europe’s hot spots for gaming professionals. In Quo Vadis you can meet with decision makers, creative minds and leaders of the gaming industry and lay the foundation for your success.